Our rental program provides oxygen users with the mobility to travel anytime and anywhere. We have an extensive rental fleet of portable concentrators that include both pulse and continuous flow machines. All of our rental machines are FAA approved for flight. Our rental concentrators include the Inogen One G3, SeQual Eclipse 5, SeQual Equinox, Respironics SimplyGo and the Respironics EverfloQ. Your rental concentrator will ship via UPS so it arrives at least 24 hours before you need the machine (7 day minimum for shipping, 4 day minimum for local). Our support staff is available at 1-888-886-1167 should you have any questions regarding the unit or its operation. Our weekly packages start at just $210. When your rental is finished, just place the concentrator in the return box and ship back to us by dropping it off at any UPS store, Staples or OfficeMax location. The Eclipse 5 is only 18.4 lbs with the battery inside, and is 19.3 inches tall, 12.3 inches wide and 7.1 inches deep. 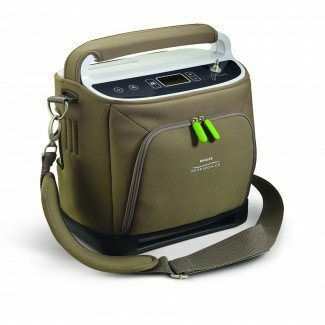 Even though it's one of the heavier portable oxygen concentrators on the market, which it needs the extra size to house the additional settings and features, it is easy to move about with the help of the mobile cart that comes with it. The AC and DC adapters for the Eclipse 5 are smaller and more powerful than the ones for the Eclipse 3, so they will take up less room as you travel. The concentrator is also now fully functional and able to be charged and run simultaneously in a vehicle as you travel. The full functionality saves a lot of time and battery life for when you need it. You will also get an accessory bag with your Eclipse 5, which you can attach to the mobile cart above the concentrator to keep everything together as you travel. 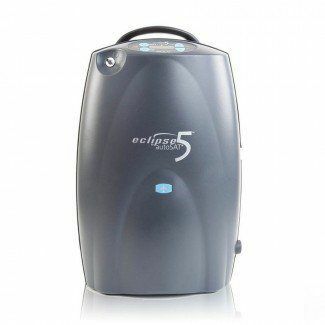 Here is a complete list of Sequal Eclipse 5 specifications and features. The Respironics SimplyGo Rental Package includes the SimplyGo Unit, one rechargeable lithium Ion battery, AC and DC adapter, custom carrying case, shoulder strap and handle strap, mobile cart, accessory bag, cannula and user manual. Here is a complete list of Respironics SimplyGo specifications and features. The Inogen One G3 Rental Package includes the Inogen G3 Unit, 8 cell battery, AC power supply, DC power cable, carry bag, cannula and manual. Please view our different Inogen G3 Packages if you require more batteries or accessories. The Inogen One G3 Portable with a 16 Cell Battery Rental has a longer battery life than the 8 cell option. The Inogen G3 is one of the smallest oxygen rentals at under 6 pounds with the 16 cell battery and measures at 3 inches, 8.75 inches long and 7.25 inches tall. It's so small and portable that is can be hand held and has a battery life that can last up to 7 on a setting of 2 with the 16 cell battery. It is a pulse dose machine that delivers pulse dose oxygen on setting from 1 to 5. 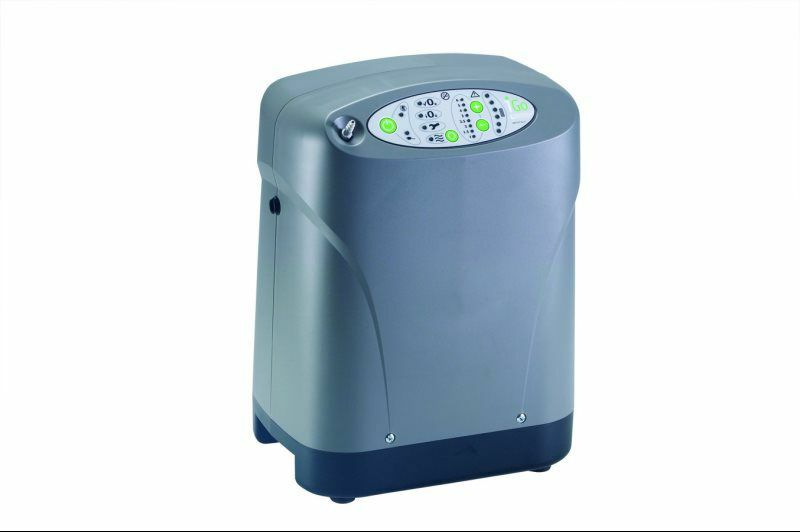 It is a great solution for a oxygen concentrator rental. The Inogen One G3 is your oxygen rental solution, for oxygen home and away. 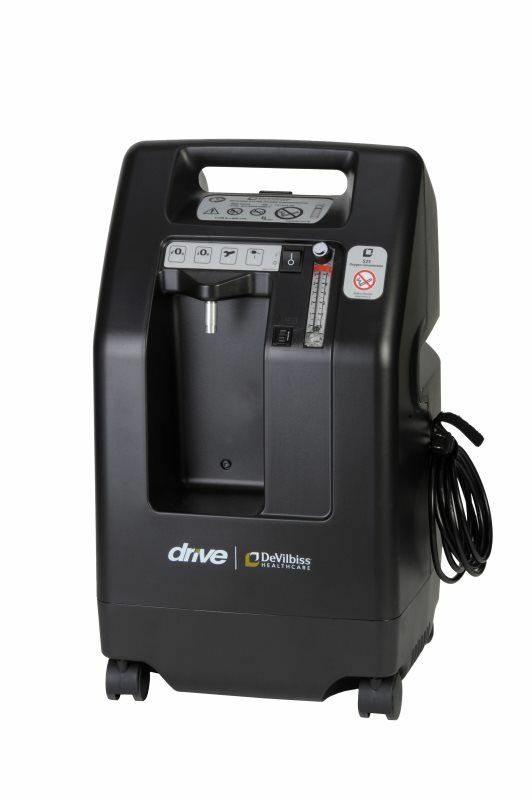 If you need to rent an oxygen concentrator that delivers continuous flow oxygen, we can have the Respironics EverFlo sent to you same day shipping. It’s a highly efficient unit whether you need it for home or vacation use. Unlike some other home oxygen concentrators, the Respironics Everflo is extremely durable, while sleek and small enough to be unobtrusive. 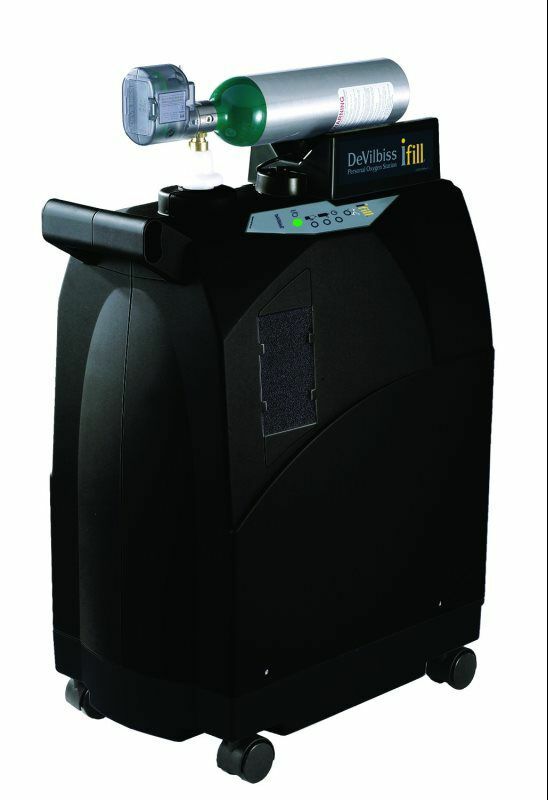 The Respironics EverFlo oxygen machine weighs 31 pounds and can deliver between 0.5 and five liters per minute of oxygen. Despite its powerful delivery, the EverFlo is a quiet oxygen concentrator, outputting just 40 decibels of sound. This makes it perfect for overnight use, as it is unlikely to wake you or your partner. The EverFlo pulls air in from the surrounding room and concentrates it into oxygen using a molecular sieve and a pressure swing adsorption process. 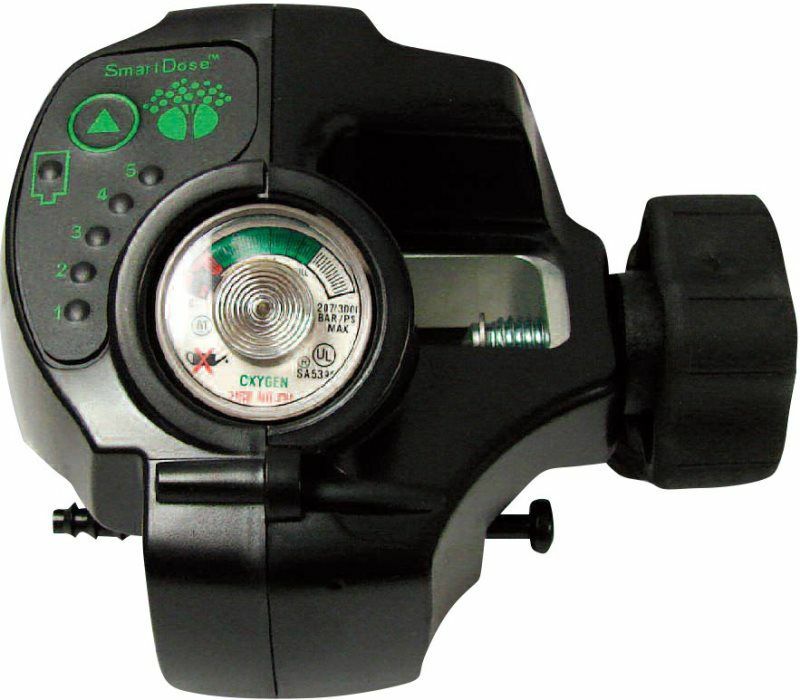 The EverFlo operates on AC power and does not have a battery. 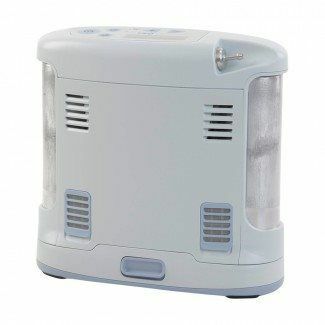 It is one of the most efficient home oxygen concentrators on the market and produces less heat than other comparable units. Operating at just 350 watts of power, you’ll notice a lower electric bill than with many other oxygen concentrators on the market. 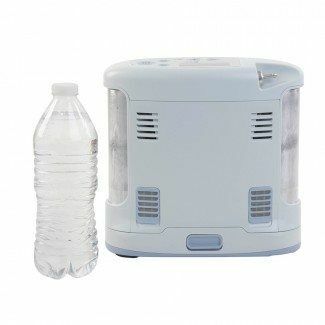 Unlike many other oxygen concentrators, this unit also features a metal cannula connector, which is durable enough to resist breakage. The Respironics EverFlo home oxygen concentrator is an excellent rental choice. 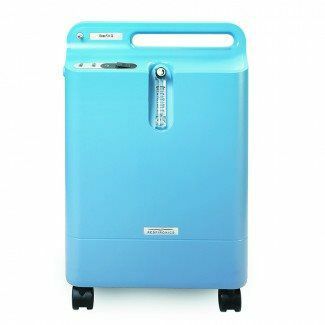 Its small size, light weight, energy-efficiency, and ultra-quiet output result in a premium machine for any oxygen therapy patient.